There are plenty of reasons why we receive emails today, but more often than not we receive an email that serves to educate us on topics we’ve shown interest in while exploring the Internet for a service, a product, or an experience (e.g Airbnb). In this blog, I’m going to discuss the art and science behind how following the inbound marketing methodology makes these email campaigns more successful. Over the last 15 years of receiving and sending emails, I have come to understand one thing – email marketing is about knowing your IDEAL buyer persona and their true interests. The key to email marketing success is cutting through the marketing jargon and getting to the point without being rude or presumptive. There are three types of people your business should be emailing. In the Know – these are people who know your brand, know your value, and may already being doing business with you or have done business with you in the past. On the Edge – these are people who are in your contact database but may not have heard from your business in a while. Contacts on the edge have never done business with you before, but might if given the right offer at the right time. Cold as Ice – these are people who you’ve done research on and know they would do business with you if they knew who you were. Now that you know the type of contacts you should be emailing, I have one question: have you defined who your IDEAL target buyer personas are? If you have, great work! Feel free to scroll down to Step 2! If not, then fear not. Step 1 below will walk you through this process exactly. After all, if you don’t know who you are speaking to with your emails, then there is no reasons for sending them. To stay on top of email marketing, today’s top small business teams must use some form of marketing automation or email marketing software. Fannit uses HubSpot, but we also have experience with others like Infusionsoft, Sharpspring, MailChimp and more. Marketing automation software enables you to not only send emails, but it also helps you gain visibility on how well your email and other online marketing efforts are doing at converting those ideal buyer personas into leads. The following is an example of our IDEAL buyer persona and the information we gathered to define the persona straight from Fannit’s marketing plan. There is a fair bit of detail to it, but you’ll see why this is important in the next steps. Ed is the owner/partner responsible of all marketing and sales for his small business which employs between 4-30 people including himself. He realizes that he has a ‘real business’ now, so he understands the importance of having a website that generates new business. His business generates between $1M – $5M annually, but it feels to Ed like he needs professional outsourced marketing help. Depending on the industry you are in, your ideal buyer persona might look slightly different. Below are Fannit’s top buyer personas. Ed writes the check for our services, but may also have an assistant and or someone in charge of operating the business and or marketing with Ed – like a Marketing Manager or Operations Manager. Ed has gotten over his skepticism that others can do marketing as well as he has been able to. He has a full-time resource working sales along with him and helping with marketing. Ed has had a website design done before and may have CRM (Customer Relationship Management) software, so he is not unfamiliar with hiring outsourced help and see the value of technology. There are others in Ed’s business who help with marketing efforts and it feels to like they have a small team and an assemblance of a strategy, but they see a need to bring on a professional marketer – enter the marketing agency. Next level sales growth, busting through the $1M, $3M, $5M or $10M mark! Ed still works long hours and is psychologically ready to admit “we don’t know everything and we need marketing leadership help” – this is very humbling to Ed, but he is ready to give control to others he oversees. He is very frugal with his budget, but will invest in his business if he feels he is getting good leadership, communication, and results. Our IDEAL buyer has interviewed “other marketing companies” and everything still sounds the same to him, but he knows the type of person he and his team will work well and is willing to put in the time to find that resource. Ed doesn’t want to be taken advantage of and often asks questions like “Why are you the right company to be working with?” as a way to protect himself. Ed and the company is not ready to hire a full-time CMO (Chief Marketing Officer). Ed’s business is not flat because the business is in trouble, it just needs a boost to help scale to achieve their next year’s revenue goals and a lot of pieces can fall into place. Possible other ideal personas to watch out for are Molly the Marketing Manager who helps Ed, but are also looking for help because they are unable to execute all the necessary marketing work needed to be successful with modern marketing efforts for small businesses. If you are trying to reach your ideal buyer with email marketing, you need to know who they are and what challenges they are trying to overcome in order to speak to them about topics they care about. Once you understand WHO your ideal customer is, you’ll need to determine what sort of information is available to them on the Internet about your business. Although your email marketing is going directly into your ideal buyers email inbox, they may not click on anything in the email (to avoid being marketed to) and decide to do some quick researching of the topics in your email on their browser. This is why it is essential to understand what is being searched. To find out what your ideal buyer persona might search for themselves and seeing what information shows up. 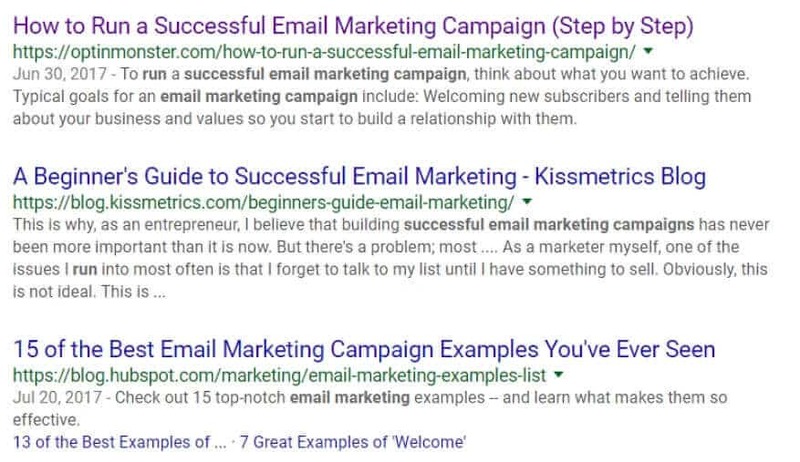 Below is what I found when I searched ‘How to run a successful email marketing campaign’. The image above outlines some very compelling content that is being ranked. Being a good email marketer means you understand what your audience is looking for and why they think it is so valuable – valuable enough to search for it. Now that you know what is ranking on the Internet related to the topic(s) your buyer persona(s) are looking for, it’s time to create educational content for readers to download. Educational content offers can also be used by your Sales team members in their own emails. If you really want to impress, create two versions of your content offer – a simple checklist and a more detailed guide. Below are a few of Fannit’s own examples. Since we use HubSpot marketing automation software we also need to make sure all the images our readers see in their emails and online are uploaded to HubSpot’s File Manager. 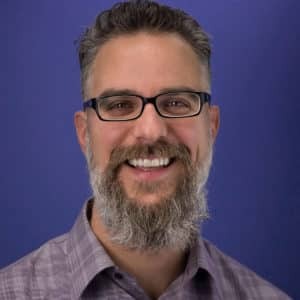 No matter what email marketing automation software you use, saving images in the cloud in the cloud rather than saving it to someone’s desktop computer helps preserve this information for future marketing efforts. The emails you send to prospects should contain links to landing pages (LPs) where the educational content can be downloaded. We use the ‘give to get’ principle – people are willing to give you a small piece of information for valuable content they care about. It is vital to think through the information you are gathering in your forms. As a general rule of thumb, we provide three levels of access to potential clients looking for our information. A basic form (shown below) helps us learn their name, their role, and their email address. After a person downloads your amazing and compelling educational content offer, send them to a “Thank You Page” (TYP) on your website where you give them an opportunity to get even more valuable information by giving you more profile data. When you see people are giving you more information about themselves it is an indication they are more interested than those people who just give you a name and an email. Whether a person fills out the basic or detailed form, we now have the information and permission we need to begin communicating via email. And since we gathered role information we can make our email communication more contextual and relevant – this means higher email conversion rates. Landing Pages and Thank You Pages. 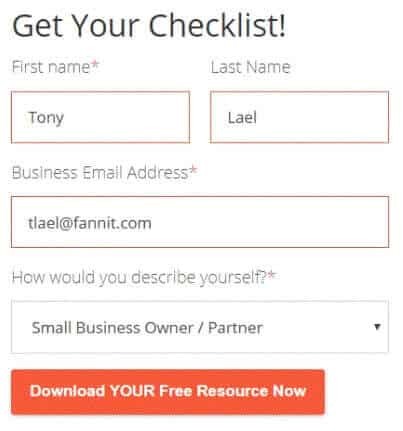 A lot of people enter valid email addresses in forms (like Ineedhelp@domainname.com), but it is obvious that this is not a real email address. To make sure only people who give you real email addresses, make sure your Thank You Pages do not include the download link, rather a quick note to let them know you’ve emailed them the information they requested. It might seem like a poor show not to immediately provide a link to the download on the Thank You Page, but this tactic enables you to ensure you are only providing your valuable knowledge to people willing to enter a valid email address. 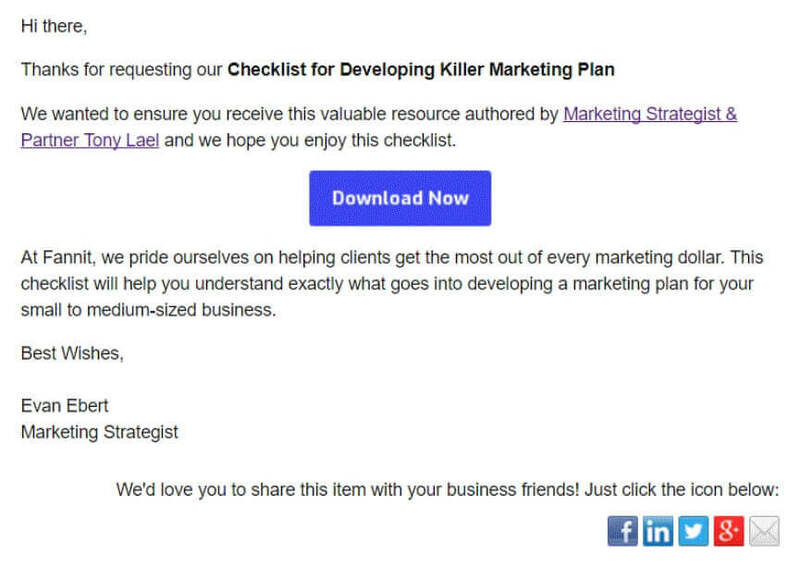 To start, send a simple email (like the one below) after someone requests to download your content. Inexperienced marketers typically stop at sending one email and assume you will contact them if you are interested in taking next steps. The truth is, people get busy and forget they even downloaded your content in the first place. This is why we recommend you establish an automated email marketing workflow to keep communicating with your prospects in a respectful, helpful, and contextual way. For most marketing automation software, workflows represent the logic behind the information you send your prospects. This logic can get extremely complicated. Below is an example of a basic workflow in HubSpot. Your blog posts should be based on the knowledge you are sharing with the world and making it available on the Internet. This is the same content you should be emailing your Subscribers (people who have opted in to get information from you). For example, we recently posted the following blog because we researched 7 years worth of marketing campaigns and figured out that there were some glaring trends that led to our failures. Share your knowledge everywhere. Also, for standard on-site SEO practices make sure you link your blog to at least 3 pages on your site. Ideally, those links are the same or similar to keywords you are attempting to rank. The link needs to be relevant to the topic; eg. writing about operating a vehicle, mention how to fill your vehicle with gas and link that to a blog called 5 Step Checklist to Effectively Fuel Up Your Car. If you have set up your email marketing system properly, all your blog Subscribers will receive an email immediately after your blog is posted. As added insurance, your Subscribers (people often also following you on social media) receive the information you are publishing on your blog, you need to promote your blog material across your social media accounts. HubSpot enables you to schedule your social posts from multiple accounts. Finally, make sure frequently review how many people are opening your emails and clicking on the link(s) you include. Open and click-through rates (CTR) vary based on several of the following factors. Elements that most influence open and CTR are the following, so spend some time on getting these aspects correct. Emails you send should be part of a larger campaign. Inbound marketing campaigns typically are organized around three areas. The following outlines how HubSpot tracks campaigns and provides visibility on the performance of each element. The following is a snapshot of a Campaign being tracked in HubSpot. We have used this blog to educate our own team. I hope this information has opened up your thinking about what all is involved with email marketing success – it’s not just sending emails to a contact list when you need more business. If you want to learn how to do this for your business, we’d be happy to help. Feel free to connect with me on LinkedIn.